I recently came up with a pin-worthy shoe storage solution that I had to share. My home doesn't really have an entryway. Nor does it have a mudroom. It just has a laundry room connected directly to the garage. So there's no great place to put our shoes. We tried boot mats on the floor, but they took up way too much space and always left us with a messy pile of shoes. I did this nearly two months ago, and it has worked out great. I simply measured the height and width of the space where I wanted my wall of shoes, and purchased a sheet of 1/2" OSB as well as a sheet of white paneling. The OSB gives it strength and thickness, and the paneling makes it look clean and finished. I could have just purchased a single piece of 3/4" white melamine, too. The guys in the lumber department at Home Depot cut both sheets to size for me, so all I had to do when I got home was to lay out the hooks and attach them using my favorite tool. Don't go thinner with the paneling. It will allow the screws for the hooks to stick out through the back side of the paneling, damaging the wall behind it. You don't want that. Home Depot didn't have any really cheap hooks, so I went to Menards. They had white hooks for $1/each, which was what I wanted to spend. 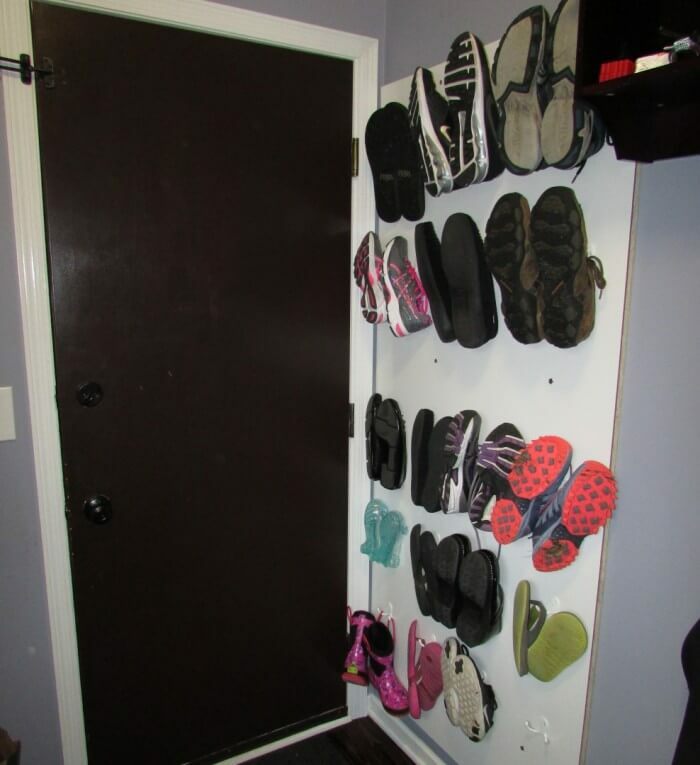 Once I had all of the hooks fastened to the boards, I mounted my shoe storage wall to the wall behind my door using a few Spax screws, making sure to hit the wall studs. Whenever I take it down, I won't have a wall filled with holes. My setup holds 18 pairs of shoes, but I could have definitely squeezed more shoes in there if I had been a little stingier with my spacing. I originally meant to have the shoes pointing down, as shown in the original facebook photo, but I found that the shoes stayed on the hooks much better pointing up. 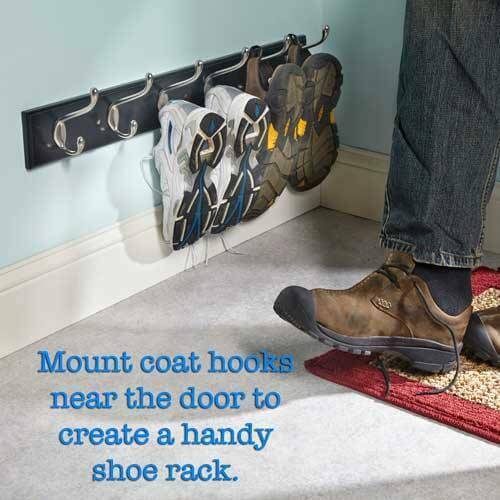 Other options for shoe storage behind a door are plastic sleeves or wire racks, but I'm not a big fan of those, and where's the fun in that?